Not too long ago, we heard about the “best” schools only by word of mouth, their reputations built over time without the benefit of roadside hoardings. Now, you cannot travel a kilometre without your eyes falling on an advertisement of an international school offering the best of facilities or a chain of schools promising your child the world. “With increasing competition there is a conscious need for schools to market themselves in order to establish the institutional brand, attract quality students, and stay ahead of the competition at all times. The aim is to attract and increase the quality of students every year, retain top faculty, increase student placement opportunities through continuous interaction with businesses, optimize cost of acquisition per candidate and increase support from alumni and benefactors,” according to marketing firm CMO Axis. These days, institutions hope to communicate with the “target segment” all year round rather than only around the time of admissions. School marketing, in India and across the world, is a booming industry at the moment, and is set to grow even further as the focus of schools is on building sustainable brands. Research by the Australia-based Centre for Marketing Schools shows that marketing spends are on the rise in response to the increased competition for students, staff, and resources. This “commercialization of education”, where schools advertise themselves in a manner that appeals to the students and parents, often reduces students to mere consumers of a product. What effect do these ads have on students? Sreekriti, a student in class 8, had seen a hoarding of a school offering horse riding classes and said she wished she studied there. At the National Seminar organized by the National Institute for Educational Planning and Administration (NIEPA) on Privatization and Commercialization of Higher Education held on May 2, 2006, in New Delhi, it was re-iterated that the “State is primarily responsible for ensuring quality education at all levels and in all regions.” However, there is an increase in demand for better “quality” education in India. To cater to these demands more firms are entering the market and there is profit to be made. Focusing more on reputation, schools are offering facilities like air-conditioned buses and classrooms, horse-riding and swimming classes, international trips, and much more for fees higher than the regular schools. Although there are more schools now than ever before, given that most of these schools require donations and charge higher fees, students from economically disadvantaged backgrounds are relegated to state-funded schools because they cannot afford this education. While on the one hand competition ensures that the infrastructural standards remain high, on the other, the profit-motive introduces a possibility that “education” itself gets left behind. A survey conducted by the Commercialization in Education Research Unit at the University of Arizona, identified a number of types of commercialization taking place in education: sponsorships, privatization, fundraising, exclusive agreements, incentive programs, educational materials, electronic marketing, and appropriation of space. Some schools have begun to organize foreign trips for their students, while some have tied-up with foreign institutions and have guest faculty visiting from abroad. At an education fair recently, my colleague and I were amazed to see that most of the teachers in one school were foreigners. Given the quality of the brochures published, it was clear that the school had put substantial resources into marketing – both to students and potential staff. While international schools had initially been set up to cater to the needs of expatriates, according to research by the online International School Community, 80 per cent of students in international schools nowadays are local. Their research also shows that the leading countries for international schools currently are China, India, Pakistan, the UAE, and Thailand and that future growth is expected to be centred in Southern Asia, particularly in India and Pakistan. 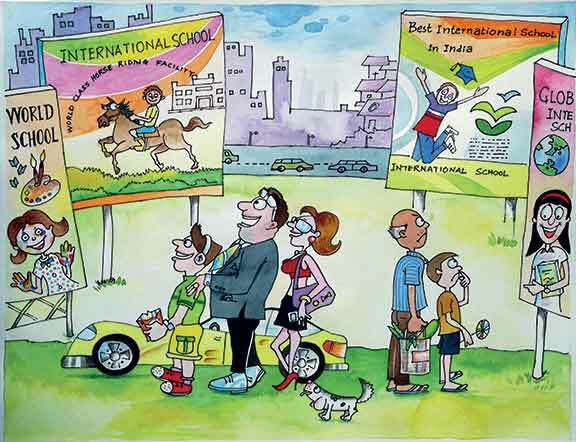 There seems to be this perception that studying in an international school will help lead the way to further education at the world’s top universities and this in turn is driving the establishment of ‘international’ schools in the country. In some schools which require a “donation” from the parents for the admission of their child, the needs or merit of the student take a back seat. Sriparna, who taught in Krishnamurti Foundation schools for 15 years, says, “We need to keep in mind what is ‘best’ in education for the teacher and the student. With some of the chain based schools with a centralized curriculum, there is no scope for teachers to be a part of the process of creation to provide more contextualized resources for the students. Standardization of the curriculum is disabling. Right from school buses to uniforms to even the textbooks prescribed, the decisions taken by some of these schools are driven by the market.” In traditional education, when the focus was on student learning, a teacher’s role was very important. With the market playing a major role now, a teacher’s role is often reduced to that of an employee who is expected to follow procedure and work in the best interest of the institution, the sponsors, and the board. The Canadian International School, in Bangalore, in its “Strategic vision” mentions the following: “Attract, develop and retain the best qualified international, regional, and local educators who consistently support, promote and apply the mission of the school”, and “Have a marketing plan which ensures the school is well-known, is the school of choice and is supportive of internal and external stakeholders.” There are marketing calculators available online for schools to determine the level of marketing activity required to achieve their enrolment goals. Schools that were approached were reluctant to disclose their efforts or percentage of the school’s budget spent on marketing. Education, in true Indian tradition from the time of the gurukuls, was never about profit. The mushrooming of schools and learning centres is a result of the changes in the traditional concepts of education in our society, including the student-teacher relationship, and the purpose and perception of education. When there is a demand for schools, private or otherwise and a concommitant demand for technology-centric learning, and extra-coaching classes such as those for the IIT entrance, it encourages firms to enter the field of education to fill these gaps. In the past few years, there have been a number of learning centres that have come up to add to the teaching-learning process in the classrooms. Given that these centres are not bound by boards of education, they are free to venture beyond the prescribed ‘syllabus’ and focus on learning rather than marks. As most schools do not make use of technology as a tool in the classroom, institutions have come up to provide students with the opportunity to do so. However, there tends to be a larger focus on mathematics and science in schools and centres merely because doing well in these subjects ensures remunerative jobs in the market at a later stage. Thus, even the relative importance of subjects is often market-driven and not necessarily aimed at developing the child’s potential. We need to take a step back and look at who would benefit most from the commercialization of education. If it is not the students and the teachers, we will, as a society, have to re-think the whole process. We would also need to consider what role knowledge has in education commercialization. One of the challenges we face is to encourage the growth of schools and learning centres without allowing them to commercialize the education itself. As parents and teachers, we would certainly benefit from examining the level of commercialization of education in the country, question what “education” means to us, and base our decisions on what will provide our children with a truly holistic education. Fiske E.B. & Ladd H.F. (2000). When Schools Compete: A Cautionary Tale. Washington, D.C.: Brookings Institution Press. Walberg H.J. & Bast, J.L. (2003). Education and Capitalism: How Overcoming Our Fear of Markets and Economics Can Improve America’s Schools. Stanford: Hoover Institution Press. Education at the cost of ethics?